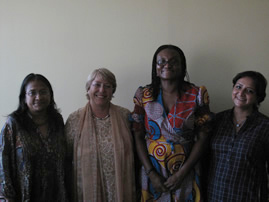 Pathways researchers, Naila Kabeer, Dzodzi Tsikata and Hania Sholkamy, working on paid work as a pathway to women’s empowerment discussed their findings with UN Women Executive Director, Ms Michelle Bachelet in a courtesy call in early July. They then gave a presentation at a public meeting held at UN Women on the 5th July. See Pathways policy paper ‘Contextualising the Economic Pathways of Women’s Empowerment’ for an overview of their research.